Nepal is seeking help from the international community to settle a long-running dispute about the height of Mount Everest, officials have said. China has long argued about how the peak's height should be measured, and the countries appeared to have agreed Nepal's figure of 8,848m in 2010. The dispute has never seemed fully settled, however, and shifting geology in the region could also add confusion. Nepal is now seeking international help to support a new, official measurement. With outside funding, expertise and equipment, it hopes to complete the job and finally, quantitatively settle the matter within the next couple of years. "Since we lack the capacity to do the job on our own, we are preparing a project plan with the request for donors and we will soon be sending them out," Krishna Raj BC, director general of Nepal's Survey Department, told BBC News. He said the three-year project was finally getting under way, with much remaining to be done. "Funding and technology have been the main constraints. We don't have, for instance, the equipment that works in a place with -45C temperature," he said. "We basically need data from gravity instruments, levelling points and the global positioning system (GPS) to get a complete picture. "For all these technologies to work, first there has to be infrastructure in places like the Everest base camp, and then we need to mobilise Sherpas up and down the mountain with someone who can handle all those technologies. "And then finally, the data will have to be processed in such a way that it will be acceptable to the international scientific community." The need for a fresh measurement has arisen mainly as a result of the dispute with China, which rules Tibet, on whose borders the mountain range also sits. China had argued the world's highest mountain was nearly 4m shorter than Nepal's official figure, contending it should be measured to its rock height. 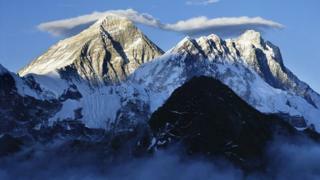 Nepal has said that the snow height should also be included, as with other peaks in the world. The disagreement surfaced in past meetings on the two countries' Himalayan borders, and recently scheduled talks on the matter were postponed. Nepali officials say even if the issue of Everest comes up during border talks, they will stick to what Nepal maintains is the official height of the mountain. But they also say a fresh measurement has become necessary to "set the record straight once and for all." Geologists say the Himalayan peaks are young and still growing as the Indian subcontinent slides under the Eurasian plate, causing the mountains to rise further. Officials said a Danish university and an Italian NGO were already trying to help the Survey Department to make formal measurements. But they added that these foreign organisations have limited funds and capacity to offer, and therefore more support from international community is required. They said it was yet to be decided how much funding would be sought, and some critics have said the project may become too donor-dependent. "The project to measure the height of the Everest is being developed in such a way that Nepalese officials and experts will have quite less say," said Buddhi Narayan Shrestha, a border expert and former director general of the Survey Department. "This project will be basically about foreigners doing the job for us even when we have technology, software, and expertise to do so much on our own." The height of Everest has been disputed ever since the first measurement was made in 1856, with the broadly accepted height of 8,848m first recorded by an Indian survey in 1955. In 1999, an American team used GPS technology and recorded a height of 8,850 metres - a figure now used by the US National Geographic Society - but again, Nepal did not accept that and continued to use its own official figure.